A motor home Class A Diesel pusher is also referred to as simply a diesel pusher, or a diesel motor coach. It is the largest type of RV and the most powerful. It runs on a diesel engine which uses highly compressed heated air to get its energy and it is more efficient than a regular gas engine. A gas-powered motor coach is usually slightly smaller and less powerful so you will not be able to tow as much weight as you would with a motor home Class A diesel pusher. If you are considering purchasing a new or pre-owned diesel pusher there are things that you should look at before you buy-like where to buy, what features are important to you, and how to finance it. Where you buy your recreational vehicle is nearly as important as the recreational vehicle itself. To find a perfect new or used motor home Class A diesel pusher you can check out the inventory at a dealer like PedataRVCenter.com. Not only do they carry the full line up of the 6 models of Holiday Rambler diesel pushers, but you may also find your next diesel pusher in a wide selection of pre-owned makes and models from other industry leaders. A motor home Class A diesel pusher is an important investment and you deserve the best. A caution if you are considering buying from a private seller-remember that it is “buyer beware.” You will not have any protection if something goes wrong in the days, weeks, or months following your purchase. With a reputable dealer, you will be able to get an extended warranty, financing and customer service after the sale. When you are looking at a motor home Class A diesel pusher, you will want to look at all of the available features. These are already the best equipped of the recreational vehicles-the most like your “home away from home.” You can find features like hardwood cabinets, tile flooring, plush furnishings with numerous floor plans, slide outs, full-size appliances, and the list goes on and on. A motor home class A diesel pusher is the ultimate in travel luxury. You may feel like the standard options are just perfect or you can get an upgraded model if you choose. Your diesel pusher can be customized to your lifestyle, whether you are a family looking for something to take camping, or a couple heading into retirement looking for a nice ride. Financing a motor home Class A diesel pusher can be easier than you might think. At Pedata’s website you will find all of the tools that you need from pre-approval to finalizing the loan. First, check out the online RV financing calculator. You simply enter the estimated cost of your new or pre-owned motor coach and you can adjust the length of financing and the interest rate until you come up with a payment that fits your budget. 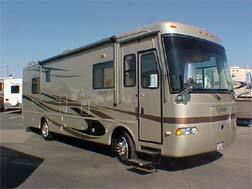 Then, get pre-approved for your motor home Class A diesel pusher loan by filling out the online credit application. Once you have decided on your “dream machine” and worked out the details with one of the helpful sales associates, they can match you with the perfect loan product for your needs. 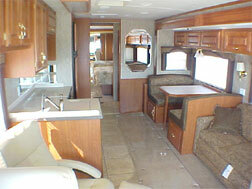 You will get a loan that is specifically designed for RV buyers. Whether you call it a diesel pusher, a motor coach, or just a motor home, you will love the feeling you get traveling along the highways and byways in your new home on wheels. “Road trip” takes on a whole new meaning when you travel in one of these fine recreational vehicles. The choice is up to you. >> Shop Holiday Rambler Admirials New and Used Online!